Corleone, in the film, asks Apollonia’s father, on the patio, for his permission to formally court her. A traditional Italian Sunday family dinner, and the eventual outdoor wedding reception, during which the newlyweds are seen dancing, was also staged on that veranda in front of Bar Vitelli and in the tiny piazza. Nearly a half-century after The Godfather’s premier, visitors to Bar Vitelli and its patio find it exactly as Corleone did in the movie – complete with the beads hanging from the door and the “Itala Pilsen” metal sign on the building’s flagstone facing. 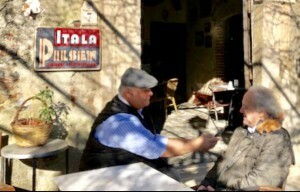 They’ll also hear gentle Italian mandolin music playing, including unmistakable melodies from The Godfather’s soundtrack. From that veranda visitors can also see a silhouetted monument to Coppola. Production photos snapped during the filming and newspaper clippings adorn the walls of a small interior room. Tasteful, unique Godfather souvenirs are sold alongside a counter offering espresso, brioche, granite di limoni (Coppola’s favorite), Sicilian wines, and other tasty tipples. Tourists to the region, including, historically, the Hollywood crowd, typically stay at hotels such as the luxurious Belmond Grand Timeo in nearby, glamorous, Taormina which was, ironically, where James Gandolfini, who played a mob boss in the television series “The Sopranos,” was headed when he died of a heart attack in Rome. But pilgrimages to Bar Vitelli are so popular that Motta and his wife Nuccia will, for the first time, open 10 guest rooms, an event terrace, and subterranean wine tasting room in March. “Savoca is a magical, simple place with a beautiful panorama of the sea below, the mountains, and the Mt. Etna volcano,” said Motta. The 13th century Church of San Nicolo (now known as Santa Lucia), from which Corleone and Apollonia are seen processing following their wedding is perched upon the dramatic mountainside. Visitors can retrace the ill-fated couple’s steps. What moviegoers don’t see in the film – but tourists will view upon visiting – is the jaw-dropping, sweeping view of the sea and mainland Italy far below seen from both Bar Vitelli and the church. Coppola, in directing The Godfather, hid those views in the scenes since Savoca was meant to portray the town of Corleone, which in reality is hours away in the Sicilian countryside and unremarkable visually. Delta Airlines flies, via Rome, to Catania Airport just over an hour from the Taormina/Savoca/Forza D’Agro “Godfather” region.